There is a story about one Fijian who was briefly on Leinster’s books a good few years back. The mercury had plummeted, the wind picked up and the Dublin sleet was coming in sideways. The poor player had never witnessed anything like it and steadfastly refused to budge from the relative warmth of the Leinster dressing room for a outside session. You suspect that Glasgow’s new Australian signing Ratu Tagive may have been tempted to do something similar this week after the bracing weather across Scotland. When the former rugby league winger/Brumbies squad member/Australian sevens hopeful was asked about his desire to extend his stay in Glasgow beyond the one year of his current contract his reply was heartfelt. Tagive is an engaging, erudite and relentlessly upbeat character with a lot more to say for himself than your usual run-of-the-mill rugby professional. He was doing a psychology and nutrition course at the University of Canberra back home and he has already picked the brains of a few senior players who have recommended the Open University as and when he gets the chance to open a book again. He may not know what this step into the unknown will do for his rugby career but Tagive knows exactly what he’s doing when that career comes to a halt. “I would love to work with athletes. The goal is to work with Pacific Islanders and indigenous athletes, Australian athletes with aboriginal and Torres Straits backgrounds,” says the man born in Australia to Fijian parents. Tagive may sound like he in auditioning for the Miss World title but it is refreshing to come across a professional player with interests that extend beyond the narrow confines of a rugby field. Perhaps it is down to the fact that his own career has been bumpy and professional rugby is still not a given. He has received plenty of sport’s equivalent of the Dear John letter and his childhood was a troubled one. His mother was a gambling addict and at least part of the reason for moving to Canberra was to escape what was clearly a testing family environment. At six foot three inches and tipping the scales at 16-odd stones the big man may be dwarfed by his pal, former Warriors winger Taquele Naiyaravoro, but he is still a handy size with a decent turn of pace. Now he has to learn the niceties of a new game because most of his rugby was league, alongside Naiyaravoro at West Tigers and the Bulldogs and he calls the two codes “chalk and cheese”. That move to Canberra and a highlights reel of him playing on YouTube was spotted by Brumbies coach Stephen Larkham and the league player “jumped over to the dark side”, as he calls the switch to union. But while he trained with the Super Rugby franchise, he was never actually asked to pad up for them. A trial with the Australian Sevens squad ahead of Rio could have opened up another avenue into the pro-game but he missed the Olympic cut and had returned to the amateur game with Sydney’s famous Eastern Suburbs club, where he met sometime Glasgow Hawks prop Steven Findlay who played a season with the club fondly known as the “Easty Beasties”. “I made up a highlights reel and he [Findlay] shared it on social media and the club [Glasgow] got wind of it and here we are,” says Tagive. “It happened really quickly, a bit of a whirlwind, but that is how it came about. “Australians think that it’s only 12-man rugby over here, just play-it-up-the-guts type of thing, but just being at training and also the turf, it’s really hard and fast and gives you the opportunity to play that type of expansive rugby. It’s really been a pleasant surprise to see when and where you can inject yourself within the structures that we play to at Glasgow. He joins the Warriors at an opportune moment. Not only is Italian winger Leonardo Sarto out of action for a good few months but Tommy Seymour and Rory Hughes will likely both miss Friday evening’s game against the Ospreys thanks to international duties. 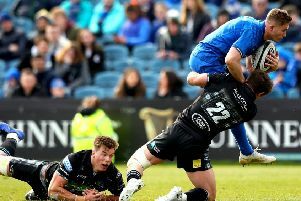 Glasgow sit in fourth place in the Guinness Pro12, one place below the Welsh region, and a win would see them into third and, more importantly, banish the red faces following their embarrassing 27-3 defeat by the Scarlets in Llanelli earlier this month. Tagive joins a long list of exotic Glasgow imports, some more successful than others. He is something of a project for the club and, if he looks like the real deal, then he could yet morph into a project player for Scotland and stay the three years that he needs to qualify, provided, of course, he can survive the Scottish winter.